Roving is the act of running a portable VHF/UHF station, often in a contest. For ARRL and similar contests, points are awarded for contacting other stations, and points multipliers are awarded for each "grid" worked. Since many grids do not have permanent VHF/UHF/Microwave amateur stations, contest organizers often provide a modest benefit in the form of additional multipliers to stations that "go mobile" and operate from multiple grids. We think operating in contests as a rover is a lot of fun, and it helps get around the fact that our homes are not ideal VHF/UHF/Microwave locations! Keeping several bands worth of radios and antennas working while bouncing around in rural areas can be quite a challenge... but it keeps us from getting bored! 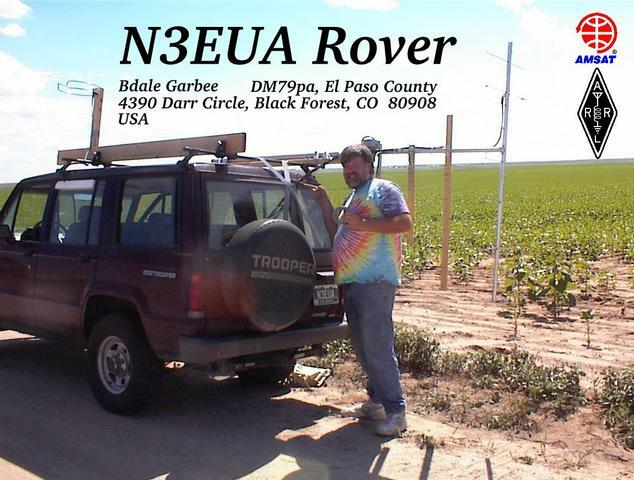 The picture on our QSL card, above, was taken by WD0FHG in DM89, during the August ARRL UHF contest in 1999. Click on the image to see a bigger version. Have duct tape, will rove! Here are a few of the places we've bought equipment for our roving operations. We like DEM! Their transverters are good mojo, and they're very supportive. They also sell antennas from Directive Systems and others, and they make a bunch of neat widgets for interfacing transverters. We've bought some K1FO yagis from these folks, and are completely satisfied. Dave's a neat guy, and he makes nice antennas. Our 6m antenna and our 2m omni came from Olde. The premier online auction site. Be careful here, but from time to time we've found good deals on gear in the ham radio and test equipment categories.